I want to thank the Selection committee of the American Hosta Society for choosing me for the Eunice Fisher Distinguished Hybridizer Award. I also want to thank my parents (deceased) and everyone who has shared their knowledge, plants, and hospitality with me. 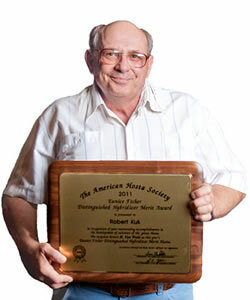 I first began hosta gardening when my parents purchased the property now known as Kuk's Forest in 1970. I found out about the AHS through an article in the New York Botanical Garden Pamphlet on Shade Gardening in 1969 and bought my mother a membership. I began buying hostas from Gray & Cole Nursery (near Boston, MA), and Pete and Jean Ruh's Sunnybrook Farm in 1970. I purchased sieboldiana's from Gray & Cole for $1.75 per division. Coincidentally, 'Francis Williams' was $10.00. 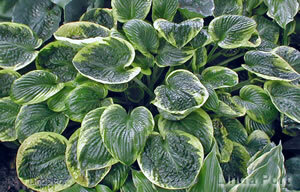 I began purchasing hosta seed from Pete Ruh in 1971. Through Pete and Jean, I met Pauline Banyai and Bill Zumbar. We met many times throughout the 70's trying to organize a local hosta society that never materialized. Pauline helped to successfully start the Michigan Hosta Society. In 1972 I enrolled in the Agricultural Technical Institute (ATI) in Wooster, Ohio. I grew hostas from seed in the greenhouses in 1973 and replanted the seedlings in the woods at Kuk's Forest. I was in the first graduating class of ATI in 1974 with an AAS in Landscape Design. I attended my first Hosta Convention in 1976 at Kingwood Gardens in Mansfield, Ohio. I met Alex Summers, Paul Aden, and Mildred Seaver. We went on a bus tour to Handy Hatfield's in Circleville, Ohio. Paul Aden entertained us playing his harmonica. Pauline gave me her 'Gold Standard' in 1976 and 'Moonlight (Sonata)' in 1977, later registered as 'Moonlight'. My first seedling selection was from H. 'Kabitan' OP. I named it 'Bizarre' because it took 7.5 years to bloom. It was registered in 1986. Selections from H. 'Tardiflora' OP were 'National Velvet' (1990), and 'Emerald Necklace' (1994), which was a seedling sport. I learned hybridizing through a college textbook on plant propagation. In 1980, I selfed H. 'Decorata' and selected a creamy-margined seedling, which I named 'Goddess of Athena' (1987). The clump sported 2 splashes, which was named 'First Impressions' (1991). Ed Elslager referred to it as "Super Mom" and used it in his breeding program. I gave countless margined seedlings and splashes to Ed to be used for seedling exchanges and auctions. I just started last year in using it as a pod parent with crosses of 'Caesar Salad' and 'Uncle Albert'. All my knowledge of selections of seedlings and sports are based on trial and error. In 1982, our gardens were selected to be a tour garden for the 1985 AHS convention in Chesterland, Ohio. On the tour, a sieboldiana clump was selected for the Eunice Fisher Award as the Best Blue in a tour garden. I registered it as 'Gray Cole' (1985) to honor the nursery from which I originally purchased it. H. 'Gray Cole' eventually earned 2 more awards: Lucille Simpers and Midwest Blue. We also received the Harshbarger Landscape Design Award for our gardens. It was on this tour that I first met Van and Shirley Wade along with Herb and Dorothy Benedict and formed a lasting friendship. I was given a personal VIP tour of Wade Gardens in August 1985, and Van told me of his visions for his nursery. The only display gardens at that time were around his house and office building. I could see at that time that he already had "Hosta Fever" and wanted to acquire all of the varieties available. As the years went by, I saw all the gardens evolve and materialize. The extensive display gardens and waterfalls were a large compost and swampy area in 1985. All his boulders are from his tree farms, Canada vacations, and from other rock collectors. In 1986, I started visiting with Herb and Dorothy Benedict at their home and gardens at Wilson Lake, which was a resort area dotted with cabins and houses. None of the roads were named. I would visit them four times a year, either staying at the Hillsdale Motel or sleeping in my truck. Twice I slept in his small cottage across the road. He had very few visitors at that time. I started trading with Van and Herb in 1986 giving them new selections which I had made. Both Van and Herb started grouping gardens by Hybridizers. In 1987 I received 'Dorothy Benedict' and 'Nifty Fifty' from Herb. This also was the first year that he gave me a flower scape of splashed seedpods from 'Dorothy Benedict'. I received these scapes from 1987-1992. He gave them away because he was afraid that he wouldn't live long enough to see the plants mature. "Boy, was he wrong!" From those seeds I named 'Van Wade' (1990), 'Roseann Walter' (2002), and 'Simply Sharon' (2004) and have the breeder-'Dorothy Benedict' x 'Rippling Waves'. I still have other 'Dorothy Benedict' seedlings, which I am evaluating and will name in the future. I started my nursery business in 1987 after getting requests for the H. 'Gray Cole' in 1985. I began my nursery selling four varieties. This was before tissue culture labs. Prices for new varieties were set by donating them to the convention auction. Whatever it brought at the auction was the price you would charge per division. 'Gray Cole' was $75.00. Prices at auctions back then were still pretty high. Cartels were formed in order for a group of individuals to bid as a group in order to get a prized variety. One such cartel was Bill Brincka, Basil Cross, and Leo Sharpe. More and more people began visiting the Benedict and Wade gardens as the years progressed. It was not uncommon to have people show up at Herb's uninvited, and he gladly opened up his gardens to them. I eventually made a map to show directions to the Benedict gardens. Ken Anderson, Hideko Gowen, and Don Dean toured the gardens after a Michigan Convention, in Ken's "green bus". In 1980, I began using the K-Series in order to classify my seedlings and sport selections. Van Wade talked about erecting his "Big House" which would have minimal heat. I eventually potted up my K-Series and they were growing at Van's for evaluation including K1 'Bizarre', K-33 'Razzle Dazzle', K-43 'Cordelia', K-80 'Van Wade', etc. I learned from Herb, who declared "It is easier to remember seedlings by name instead of number" and "to always give credit to those people who came before us. This keeps their memory "alive." I learned from Dorothy who asserted, "You have to learn to throw away (cull) seedlings. You can't waste your time and space to grow them all." In 1987 I selected K-80, which was a 1986 seedling from 'Dorothy Benedict' seedpods, which, I received from Herb. It was green with a cream margin from Herb's cross of 'Dorothy Benedict' X 'Northern Lights'. It was potted and placed in Van's big house. I had a roped off area of 10' x 20' for my selections. I would visit with Van and Shirley on Sundays, sometimes twice a month. Van would constantly tell me about that plant and show it to me in the big house. This obsession continued for the next few years. In the early summer of 1989, I gave a division to Herb and asked his permission to name it after Van. He said it was a good plant and a good name. In late summer of 1989, I got into the big house and put H. 'Van Wade' on the back of the label. I knew that he was going to show me that plant later in the day. I told him that I wanted to photograph it and convinced him to hold the pot and straighten out the label. I thought he was going to pass out when he saw his name on that label. It was registered in 1990 as Hosta 'Van Wade'. Even after 1990, he continued referring to the plant as K-80. This is my plant selection for this award, which honors Herb Benedict for making the cross, me for the plant selection, and Van for the name.